"Agility in the mind and at the heart of your organization"
Do you want to shorten your time-to-market and thrive in today’s rapidly changing market? Have you noticed the gap between a great idea and the actual final product? Do sales, business and IT each seem to speak a different language? Are your employees losing their drive? Sounds familiar ? Time for a radical change. An agile transformation will make your organization highly-adaptive and self-organizing at all levels. Products and ideas will be realized efficiently, in mutual consultation and on time, by motivated teams. Your company can only grow if everyone is on the same page. Building an agile high-performance organization requires a full metamorphosis. Our coaching ensures agility will flow through every layer of your organization. What if full-scale transformation isn’t an option? We can guide your teams to take their first steps with Scrum and/or Kanban, or inspire your organization with targeted workshops. Want to learn more about specific topics, such as agile awareness, agile requirements or product ownership? Our training courses bring a deep understanding and practical tips that are instantly usable. The world is changing rapidly. How can you keep meeting your customer’s requirements and take advantage of the multitude of developments in the market? Agility is the key. Agile in the Core gives your organization the agility it needs to thrive in a complex world. Your metamorphosis journey starts with setting your compass in the correct direction. Together we identify the objectives of your transformation, and we define the required measurement tools. Step-by-step, we follow the path shown by the compass. Every workshop, training session and coaching is a deliberate step forward. The success of our approach is noticeable in a shorter time-to-market, greater autonomy and improved communication. Cegeka is an experienced market player: our coaches have more than ten years of experience with agile software development and agile organizations. Drawing on our expertise, we guide you through your agile transformation. Our coaches help you to define measurable business objectives. During our coaching journey, at regular intervals, we use these objectives to check the progress of your organization. Our services don’t stop at the Belgian border. Cegeka has offices in central and western Europe, and customers in countries such as Germany, Italy and Austria. 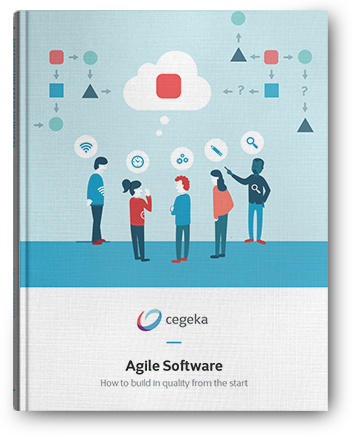 Cegeka’s Agile Software Factory has been working according to agile principles for years, on a large scale. Based on our own experience and our team’s expertise, we can advise you in the best possible manner. Organizations lose a lot of time identifying and repairing software bugs. This is unnecessary! Automation and short, efficient feedback cycles make this time-waster a thing of the past. How do you develop software in an agile manner? Take the first step towards becoming an agile company!